Proxies for mayor add insult to injury by voting to close Black schools on last day of Black History Month, in another round of attacks on educational rights. “It was truly gut-wrenching to listen to elementary and high school students beg this board, sometimes through tears, to protect rather than annihilate their school communities. Other students were full of anger, saying repeatedly that the board would never do to a white school community what was being done to them today. Students who were barred from the board meeting occupied the lobby of school headquarters, then took their protest – and their anger – to city hall, where they held another impromptu rally to oppose this mayor’s racist school policies. “Yet this school board ignored them – just as the school bureaucrats and the mayor who dictates their actions ignored parents, students and community residents four years ago, when Emanuel instigated the largest wave of mass school closings in U.S. history. Four years ago, the burden of those school closures fall overwhelmingly on the shoulders of Black and Brown students. Today was no different. “The reality is that this mayor and the school bosses he appoints don’t give a damn about the well-being, education or future of this city’s working class Black and Latinx students. Quite the opposite. This mayor, like the mayor before him, has ratcheted up school privatization, disinvestment and nakedly racist funding policies that undercut working class students of color. Emanuel’s proxies today rubber stamped a longstanding racist cycle of disinvestment in Black neighborhoods. The mayor controls the school board — and mayoral control continues to drive these policies, while shielding the board from repercussions for their actions. 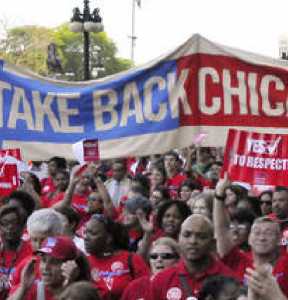 “Twice, now, the Illinois House of Representatives has voted overwhelmingly to end the mayor’s choke-hold on the school district and provide for an elected, representative school board in Chicago. Yet the legislation remains stalled in the Illinois Senate. It’s time for Senate leadership to take the path of democracy and justice, and join the House in granting the largest school district in the state the same democratic rights enjoyed by the rest of the state. 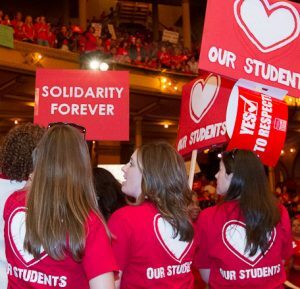 The Chicago Teachers Union represents nearly 25,000 teachers and educational support personnel working in Chicago Public Schools, and by extension, the nearly 400,000 students and families they serve. The CTU is an affiliate of the American Federation of Teachers and the Illinois Federation of Teachers and is the third-largest teachers local in the United States. For more information, please visit the CTU website at www.ctunet.com.